"Land of Hope and Dreams"
"The Rising" is the title track on Bruce Springsteen's 12th studio album The Rising, and was released as a single in 2002. Springsteen wrote the song in reaction to the September 11, 2001 attacks on New York City. It gained critical praise and earned Grammy Awards for Best Rock Song and Best Male Rock Vocal Performance, as well as a nomination for Song of the Year. Rolling Stone named it the 35th best song of the decade. VH1 placed it 81st on its list of the "100 Greatest Songs of the '00s". I can't feel nothing but this chain that binds me. The song's religious imagery also includes references to Mary Magdalene meeting the risen Christ on Easter morning ("I see Mary in the garden"), and the Blood of Christ, although Springsteen has stated that the Mary in the song could also be the hero's wife or lover. Writer Jeffrey Symynkywicz evaluates the song as "an Easterlike anthem arising out of the darkness and despair of September 11, a national Good Friday experience if ever there was one." The single was released ahead of the album, initially appearing on AOL First Listen on June 24, 2002 and then being officially released on July 16. There was a considerable marketing push for the single and the subsequent album, based on the September 11 connection and on being the first studio recordings from Springsteen with the E Street Band in 15 years. "The Rising" also debuted Springsteen's collaboration with producer Brendan O'Brien, who gave Springsteen a somewhat more modern-sounding feel than did former producer Jon Landau. Although "The Rising" was not a pop hit, peaking at only #52 on the Billboard Hot 100, it achieved significant radio airplay early on and kept it in some quarters, making #24 on the Mainstream Rock Tracks chart, #16 on the Adult Contemporary chart and #1 on the Triple-A chart in the U.S. It did not place on the UK Singles Chart. "The Rising" was included on both of Springsteen's subsequent compilation albums, 2003's The Essential Bruce Springsteen and 2009's Wal-Mart-only Greatest Hits. A concert performance was also included on the 2003 Live in Barcelona video release. 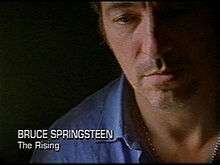 A music video of "The Rising", attributed to Bruce Springsteen, and with copyright credit to Sony Music, was shown once on the Australian Broadcasting Corporation's music video programme rage, on 20 December 2003. However, the authenticity of this music video is disputed, as no other sources have been yet found to establish whether this music video was an official Sony release (but not widely aired), an official music video that remains unreleased but for reasons unknown was broadcast unauthorised, or a music video created by an unauthorised party without Springsteen's or Sony's sanction, but which managed to defeat normal licensing and authenticity checks and was broadcast on one of Australia's national television networks. The video that was broadcast is made in hand-held home-movie style, with highly exaggerated film grain added throughout the clip. It shows Springsteen driving in the rain through the countryside, rehearsal shots inside the Southern Tracks recording studio in Atlanta, Georgia (USA), images of Springsteen strumming a guitar in an empty house, and a variety of other imagery related to the lyrics in the song. There is no lip synching in the video. The audio recording on this video is an edit of the album version of the song, and is shorter by 20 seconds. Critical reaction to "The Rising" was extremely positive. Allmusic called it "one of Mr. Springsteen's greatest songs. It is an anthem, but not in the sense you usually reference in regard to his work. This anthem is an invitation to share everything, to accept everything, to move through everything individually and together." Rolling Stone worried that, "As with 'Born in the U.S.A.', the title ... may mislead some who hear it, particularly those intent on retaliation, which Springsteen himself shows little interest in contemplating. His concern is not with a national uprising but with a rising above: the transcending of ever-mounting losses and ancient hatreds." The New York Times described "The Rising" as a work in which "one man's afterlife is an endless longing for the physical touch of those left behind, and the music climbs toward jubilation as an act of will." Eerie blue-white lighting accompanies a performance of "The Rising" during the Magic Tour in 2007. "The Rising" played during Springsteen's last-ever stand of Giants Stadium shows in New Jersey in 2009. Soozie Tyrell played her key violin part as stadium was lit in red, until the final codas of the song, when the lighting changed to white. "The Rising" was performed by Springsteen and the E Street Band on all promotional television appearances surrounding the album's release. It was then the "keynote song" throughout The Rising Tour of 2002-2003. By this is meant it was usually the opening song of the performance, or if not, was played second after some offbeat or obscure set list choice was played before it. In its live arrangement "The Rising" underwent two significant changes: the oscillating violin and keyboards line that is understated on the record became much more prominent, with violinist and new E Streeter Soozie Tyrell featured, and Nils Lofgren took the "dream of life" contravocal lines towards the end of the song. In particular the violin-based opening of the song became instantly recognizable, and signalled the thematic if not literal beginning of all Rising Tour shows. "The Rising" was also played at the 2002 MTV Video Music Awards and the Grammy Awards of 2003 shows. The song is also performed in the key of C Major live as opposed to the key of E-flat major on the album. That the difference between the bleak verses and the communal chorus was the key factor in interpreting "The Rising" was highlighted by Springsteen's own performances, when he and the audience raised their arms in unison during the latter. Indeed, many of the songs on the album had more universal interpretations available to them than just those associated with September 11, and "The Rising" proved to be no exception. This concept was further demonstrated by a country music star with rock sympathies, Keith Urban, who included a long interpolation of "The Rising" into his CMT Music Awards closing performance of his "Better Life", in tribute to, and in conjunction with accompanying choral members of, victims of Hurricane Katrina. Placed in the middle of sets during the short 2004 Vote for Change tour, "The Rising" was greeted by a strong audience response, with political echoes for those fans so inclined. When the 2005 solo Devils & Dust Tour came around, Springsteen continued to feature "The Rising", but now on acoustic guitar; it usually appeared two-thirds of the way through the show, as a return to musical stability after one of his always-an-adventure multiple piano songs slots. "The Rising" was not played during the 2006 big folk Sessions Band Tour. "The Rising" returned to a prominent spot in Springsteen and the E Street Band's 2007 Magic Tour, placed between two of Magic's most politically oriented numbers, "Devil's Arcade" and "Last to Die"; indeed, Springsteen would say that the 30-second segue coming out of "The Rising" was what "the whole [show] is going to turn on ... that's what we're up there for." "The Rising" continued to be featured as the penultimate song of the main set during Springsteen and the band's 2009 Working on a Dream Tour, where it drew a consistently strong audience reaction. And it was again a late-set staple during the subsequent 2012 Wrecking Ball Tour. On the 2014 High Hopes Tour, "The Rising" was moved up to be the main set closer for the majority of shows. During the 2008 U.S. presidential election, "The Rising" was first used as a closing campaign rally song by the John Edwards campaign. Despite the song's grim setting, the "Rise up" refrain matched the closing exhortation of Edwards' speeches. The Hillary Rodham Clinton campaign then began to use the song as well, especially at the end of her rallies or victory celebrations. Following Springsteen's April 2008 endorsement of Barack Obama, the Obama campaign began replacing U2's "City of Blinding Lights" with "The Rising" as their commencement-of-rally song. "The Rising" was performed during this October 4, 2008, Change Rocks voter registration rally on behalf of Barack Obama, on Philadelphia's Benjamin Franklin Parkway. Springsteen himself would perform "The Rising" during his solo acoustic Change Rocks appearances during early October 2008 at Obama registration and vote rallies. The song was also played immediately following Obama's victorious presidential acceptance speech on the night of November 4, 2008 in Grant Park in Chicago. Rolling Stone later remarked of its use there, "when its metaphor of struggling through darkness was blasted at Obama's victory celebration, it became a national anthem for the 21st century." Springsteen opened the January 18, 2009 We Are One: The Obama Inaugural Celebration at the Lincoln Memorial with the song. It was performed by Springsteen on acoustic guitar, backed by a 125-member female choir in red gowns; a writer for the American Folklife Center commented that, "Particularly in that arrangement, it draws on the gospel tradition. [It also draws on] the tradition of spirituals, and there's a lot of lyrics that speak to spirituals." When Springsteen was one of the recipients of Kennedy Center Honors in December 2009, the musical tribute to him concluded with Sting leading a performance of "The Rising" together with a large gospel choir. The intense rendition got Barack and Michelle Obama and the rest of the formal-dress audience out of their seats and swaying to the song's thematic development; Rolling Stone commented that the song "end[ed] the evening in an uplifting, change-the-world mode, as only Bruce’s music can." 1 2 "100 Best Songs of the Decade". Rolling Stone. 2009-12-09. Retrieved 2009-12-19. ↑ Anderson, Kyle (2011-09-29). "U2, Rihanna, Amy Winehouse, Foo Fighters fill out VH1's '100 Greatest Songs of the '00s'". Entertainment Weekly. Retrieved 2012-06-24. 1 2 Springsteen, Bruce (2005). Bruce Springsteen - VH-1 Storytellers. 1 2 3 4 Symynkywicz, Jeffery B. (2008). The Gospel According to Bruce Springsteen: Rock and Redemption, from Asbury Park to Magic. Westminster John Knox Press. ISBN 0-664-23169-1. pp. 150–151. 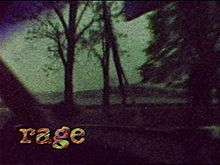 ↑ "rage playlist 20 December 2003". ↑ Jurek, Thom. "The Rising". Allmusic. Retrieved 2007-09-11. ↑ Loder, Kurt (2002-08-22). "Bruce Springsteen The Rising". Rolling Stone. Retrieved 2007-09-11. ↑ Pareles, Jon (2002-07-14). "His Kind of Heroes, His Kind of Songs". The New York Times. Retrieved 2008-03-28. ↑ "Austriancharts.at – Bruce Springsteen – The Rising" (in German). Ö3 Austria Top 40. ↑ "Bruce Springsteen: The Rising" (in Finnish). Musiikkituottajat – IFPI Finland. ↑ "Musicline.de – Bruce Springsteen Single-Chartverfolgung" (in German). Media Control Charts. PhonoNet GmbH. ↑ "Italiancharts.com – Bruce Springsteen – The Rising". Top Digital Download. ↑ "Nederlandse Top 40 – Bruce Springsteen search results" (in Dutch) Dutch Top 40. ↑ "Norwegiancharts.com – Bruce Springsteen – The Rising". VG-lista. ↑ "Spanishcharts.com – Bruce Springsteen – The Rising" Canciones Top 50. ↑ "Swedishcharts.com – Bruce Springsteen – The Rising". Singles Top 100. ↑ "Swisscharts.com – Bruce Springsteen – The Rising". Swiss Singles Chart. ↑ Symynkywicz, The Gospel According to Bruce Springsteen, p. 141. ↑ Scott, A.O. (2007-09-30). "In Love With Pop, Uneasy With the World". The New York Times. Retrieved 2007-10-12. 1 2 Nagourney, Adam (2007-12-19). "Do You Know the Words to the Edwards Fight Song?". The New York Times. Retrieved 2008-05-17. ↑ Beard, David (2008-01-06). "'The Rising?' Hillary hopes so ... with tunes". The Boston Globe. Retrieved 2008-05-17. 1 2 Bosman, Julie (2008-04-16). "Bruce for Barack: Ohhhh He's the One". The New York Times. Retrieved 2008-05-17. ↑ Miller, Sunlen (2008-04-17). "Springsteen Songs Slip into Obama's Play List Post Endorsement". ABC News. Retrieved 2008-05-17. ↑ DeLuca, Dan (2008-10-05). "Set is short, but Springsteen still long on emotion". The Philadelphia Inquirer. Archived from the original on October 6, 2008. Retrieved 2008-10-05. 1 2 Pareles, Jon (2009-02-01). "The Rock Laureate". The New York Times. Retrieved 2009-01-29. 1 2 Vena, Jocelyn (2009-01-18). "Bruce Springsteen's 'The Rising': How Does It Fit With American Folk-Music Tradition?". MTV News. Retrieved 2008-01-19. ↑ Leiby, Richard & Brown, DeNeen L. (2009-01-19). "The Stars Align, With Egos in Check". The Washington Post. Retrieved 2009-01-20. ↑ Zongker, Brett (2009-12-07). "Kennedy Center Honors Springsteen, De Niro, Others". WNBC-TV. Associated Press. Retrieved 2009-12-30. 1 2 Serpick, Evan (2009-12-07). "Eddie Vedder, Jon Stewart Pay Tribute to Bruce Springsteen at the Kennedy Center Honors". Rolling Stone. Retrieved 2009-12-30. ↑ Kreps, Daniel (2009-12-30). "Bruce Springsteen Honored at Kennedy Center By Mellencamp, Vedder, Sting". Rolling Stone. Retrieved 2009-12-30.